Product Description: Model 2752 is a precision laboratory standard Kelvin bridge for measuring resistance below 100ohms to an accuracy of +-0.03 to 0.05%. This instrument is used not only for high-precision measurement of resistance but also for measurement of electrical conductivity of conductors and calibration of low resistance instruments. It is also designed for testing large-capacity shunts and measuring lead resistance per unit length of bar or wire conductors in combination with accessory. 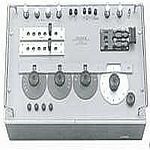 Features: Also for measurement of electrical conductivity of conductors and calibration of low resistance instruments.